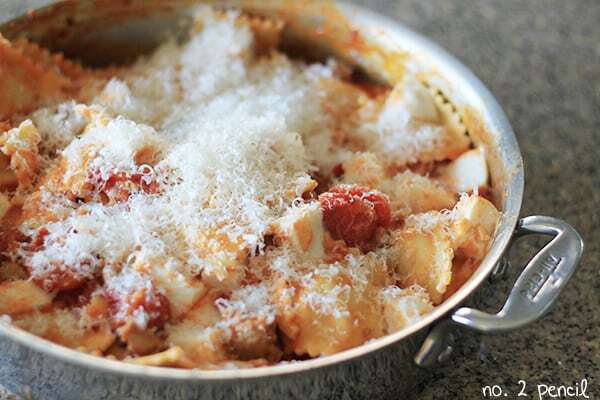 I love coming up with quick one pan meals for my family, and this Skillet Lasagna is my new favorite. It has all the flavors of a home cooked lasagna, but there is virtually no prep and it’s on the table in less than thirty minutes. I use fresh four cheese ravioli from the refrigerated section of the grocery store to bring this meal together. The ravioli pulls double duty, providing the pasta as well as lasagna’s traditional ricotta filling. 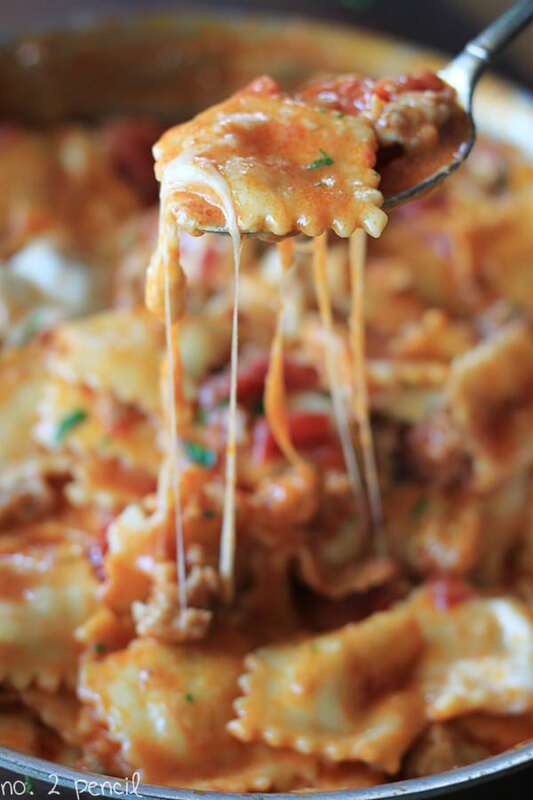 Cheesy and satisfying, this one pan meal is sure to be a hit at your dinner table! Start with a large skillet, sauté the onions and garlic in olive oil. 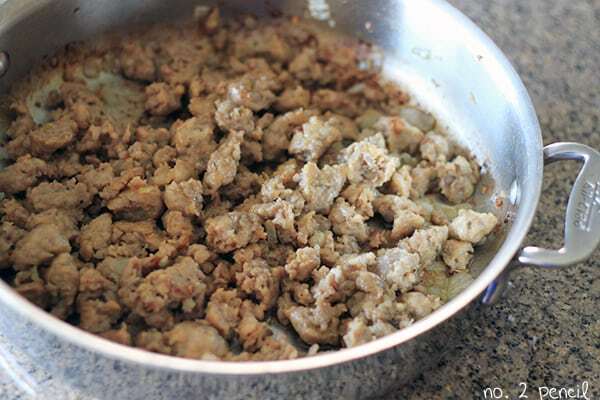 You can use italian sausage, italian turkey sausage (my favorite! ), or lean ground beef. Hold off on salt and pepper for now and add those at the end if needed. If you like a little spice, add some crushed red pepper to the onions and garlic while sautéing. 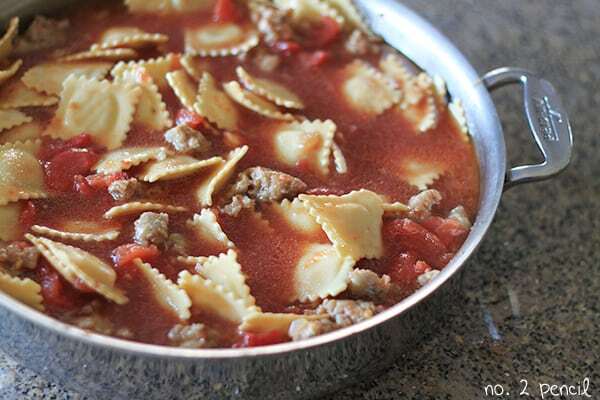 Once the sausage is cooked through, add tomatoes, tomato sauce, low-sodium chicken broth, and the ravioli to the pan. I mentioned in my Skillet Stuffed Bell Pepper recipe that I prefer to use whole peeled tomatoes – I just use my kitchen scissors to cup them up in the can – but diced or crushed tomatoes will work too. Just use what you have on hand or what is most convenient. Bring the pan up to a boil, then reduce the heat and simmer over medium heat for 15-20 minutes until the ravioli are tender and sauce has thickened. At this point, taste and see if it needs salt and pepper. The parmesan will add additional saltiness, so you may not need any extra salt. Remove the pan from the heat and stir in fresh mozzarella and parmesan cheese. I love the melty cubes of fresh mozzarella in this recipe, but shredded mozzarella cheese will work great too! If you like this recipe, check out my popular One-Pan Chicken Alfredo. I made this for dinner tonight and it turned out great! Thank you for the awesome recipe. I love it! I doubled the recipe because I was making it for a friend’s family and my own. I used one pound of turkey sausage and one pound of Italian sausage. It was perfect! My only problem was that a double recipe did not fit into my dutch oven! I had to cook it in two separate pans until it cooked down a bit. That sounds great! Thanks for sharing, I’m so glad you liked it! I love your one pot meals! They are all fantastic! Cannot wait for you to come up with even more! Looking to make this tomorrow night! Just a quick question though. Why is the pasta cooked so long? Doesn’t fresh pasta only need 4-5 minutes? It takes longer to heat through because the sauce isn’t starting out at a boil. Thanks for asking! Could this be done with frozen ravioli? Yes, just add a few minutes to the baking time! When you add the tomatoes do you have to drain them first or just dump it all in and mix with sauce? I added some ricotta cheese at the end! Whew! So yummy thanks for the ideas! Made this for Valentine’s dinner tonight- it was delicious! Note to self for next time- use bigger skillet! Ok, so this looks amazing but my husband absolutely will not eat tomatoes. He is fine with the sauce, but I cannot put tomatoes in anything or he won’t eat it. I was wondering what else I would need to add to this cause I know if I leave out the tomatoes, it will need more of something to make up for the loss. Any suggestions? More tomato sauce? Hmmm, does he eat any kind of spaghetti sauce? The tomatoes are pretty essential in this recipe, so you would definitely have to make some significant changes. Have you tried my One Pan Chicken Alfredo recipe? I bet that would work for you! Find you through……pintrest on a search for something unrelated to food, glad I did! I love these one pot meals have you ever thought of doing a cookbook? Thanks, Sarah! I would love to, hopefully one day!!! I want to add mushrooms, thinking portobello, I was wondering when I should add it, with the onions or with the tomatoes? Thanks. Sounds delicious! I would sauté them with the onions! Made this last night, great recipe. I used 1-14oz can diced Italian tomatoes and 1-14 oz can crushed and added a little red wine while it simmered. Absolutely wonderful. Thank you. Stumbled upon this recipe from Pinterest and made it for dinner tonight! Of course, after I came home from grocery shopping I realized I was still missing some ingredients and decided to wing it (because I was feeling far too lazy to go back to the store, especially during rush hour!). So I used lean ground beef (4% fat). I didn’t have garlic so I dumped a good amount of garlic powder in there, and I was also out of Parmesan so I replaced that with what I had which was Colby Jack. Despite having to replace some key ingredients, this meal was awesome! I love that the ingredient list was short and that only one pan was needed. It was quick and easy to make and so so so delicious. Will definitely be making this again (and hopefully with the right ingredients this time!). Thanks so much for sharing! very good! Husband liked it better than my normal lasagna! Will make again!, thanks! Was in a “I don’t know what I want for dinner but everything looks too hard” mode tonight. In the waiting for the “boil” and then “simmer” phases of this recipe and I can hardly wait. Couldn’t be easier!!!! That’s great, Autumn! Thank you so much for sharing!!! This has been pinned to my Dinner board for a long time. I made this for my boyfriend’s birthday. It was so very good. He is a huge fan of it. I used diced tomatoes and tomato sauce flavored with Garlic, Basil and Oregano. Thanks so much! Easy and delicious. Added some fresh basil I had in the fridge and put under the broiler for a few minutes until nicely browned.